The M6 is an American tier 6 heavy tank. 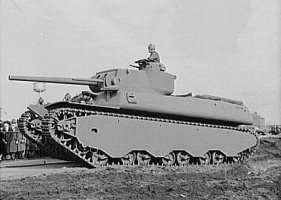 A variant of the heavy tank developed in the U.S. from May 1940, this vehicle featured a cast hull and hydromechanical suspension with a two-disc hydraulic converter. The vehicle was standardized on May 26, 1942. A total of 9 vehicles were manufactured (8 serial and 1 experimental), but never saw action. 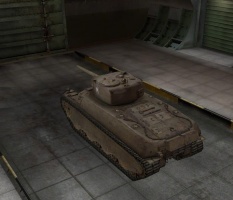 Coming out of the T1 Heavy Tank, you should feel right at home with the M6, as they look and play very similarly. It starts off with 3 rather underpowered 76mm cannons that can make short work of medium and light tanks of its tier but are inadequate for penetrating and damaging other heavy tanks and tank destroyers. The 90mm gun, however, is an excellent gun and is much more suited for the the M6. The M6 has surprisingly good engine power and great speed for a heavy of its tier, which helps to make up for its lack of armor, even frontally, which isn't adequate for bouncing most shots. Its side armor is even worse, and is easy to hit with the tank's large size. This makes the M6 almost always limited to the second line, where it can pick off enemies and take cover behind larger tanks and terrain with its decent mobility. 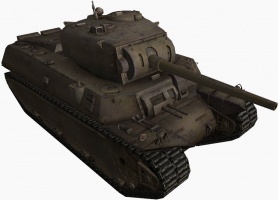 In all, the M6 is very similar to the T1 Heavy in both size and gameplay. The M6 leads to the T29. Great gun depression can be used to hide mediocre hull armor, also has relatively absurd gun elevation. While it effectively starts out as a slower T1 HT, it is able to equip a marginally upgraded 76mm gun, the M1A2, and later the 90mm M3. Upgrading the engine will bring it on par with an upgraded T1's speed. The M6 does have the best horsepower-to-weight ratio of any heavy tank in its tier, thus the outstanding speed, and you can use the quick acceleration to quickly retreat from a risky firefight with more powerful tanks. It is a good rammer, since many vehicles even at Tier VIII are lighter. However, do not expect KV-5 ramming power, especially at higher levels or against at-tier heavy tanks. Like the T1, the M6 has two gunners, this allows you to take more gunner-related skills and perks if you decide to keep the tank and train your crew up. Many strategies that work with the T1 Heavy Tank carry over to the M6, making you feel right at home. The armor has not really improved (aside from the 'belly') from the T1 Heavy, and the turret and upper glacis simply will not hold against same tier and higher guns. As such, the M6 really shouldn't be played aggressively like the T1 Heavy could when top tier and it's better suited to hull-down sniping and 2nd line support fire with the excellent 90mm gun. You can still lead pushes when top tier due to your HP pool and (for a heavy) mobility, but don't expect to bounce much incoming fire from other tier 6s. With the T1 Heavy's guns, the M6 should be played very much the same as its predecessor, only taking shots of opportunity and heavily relying on cover. 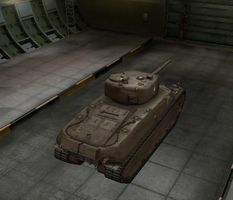 However they will have considerable difficulty against tier 7s and will be near impossible to use against tier 8s, let alone pointless, as 100 damage per shot is considered anemic against most tier 8s. Play with very cautiously, and try to get shots into the sides and rear of enemy vehicles whenever possible, if unable to, try weak spots as best as you can with the accuracy given to you. Once the 90mm is acquired this tank is virtually transformed. Although its reload time is well over double that of the 76mm guns, its penetration is greatly improved, with a little over double the alpha, and slightly superior accuracy. 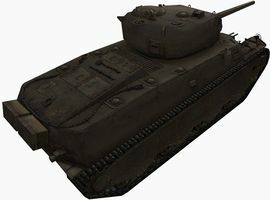 Again, like in the T1 Heavy, this tank can find relatively sound success when pretending to be a medium, although relatively long and clumsy, on top of relatively easy to punch through armor (Though unlike some medium tanks of its tier, bounces from higher tier tanks are a distinct possibility). However with the 90mm gun M6, the playstyle is slightly different. With the Longer reload time, you cannot be quite as aggressive at all as in the T1 Heavy, which promotes a noticeably more slower paced approach. Thus M6 is considerably less so able to pose as a "Shock" medium with the top gun, but is much more capable of harassing higher tier tanks, and can become a bane for lower tiered tanks as well with the 240 average alpha of the 90mm gun. Remember that you have slightly more HP with the top turret than a fully upgraded KV-85, so you can get away with being hit a few times, even by higher tier tanks, just not too much. The M1A2 gun does not get a RoF boost like every other US tank that has it, you will be undergunned until the 90mm is mounted. The SCR 538 radio, the Wright G200 Engine, and the 76 mm Gun M1A1 gun carry over from the T1 HT, so those should be equipped immediately upon purchasing this tank. Start out by researching either the suspension or the M1A2 gun. Then research the other followed by the 90mm M3 which is required for the T29 otherwise the 76 will cause the T29 to be a liability to the team. 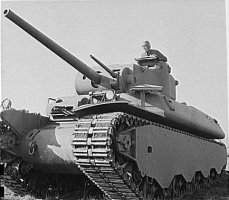 The Heavy Tank M6 was an American heavy tank designed during World War II. The tank was produced in small numbers and never saw combat. 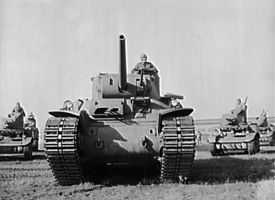 Because of limited budgets for tank development in the interwar years, at the outbreak of World War II, the US Army possessed few tanks, though it had been keeping track of armor use in Europe and Asia. Successful employment of armored units in 1939 - 1940, mostly by the Germans, gave momentum to a number of US tank programs, including a heavy tank program. The United States possessed a massive industrial infrastructure and large numbers of engineers that would allow for mass production of tanks. Following the Chief of Infantry's recommendation from 20 May 1940, the US Army Ordnance Corps started to work on a 50-ton heavy tank. Initially, a multi-turreted design was proposed, with two main turrets armed with low-velocity T6 75mm (2.95") guns, one secondary turret with a 37 mm gun, a coaxial .30 caliber (7.62mm) machinegun, another secondary turret with a 20 mm gun, and a coaxial .30 caliber machine gun. Four .30 caliber machine guns were to be installed in ball mounts, two in the glacis plate and two in the rear corners of the hull. 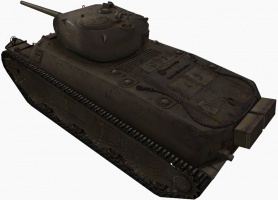 The project was approved on 11 June 1940, and the vehicle received the designation Heavy Tank T1. 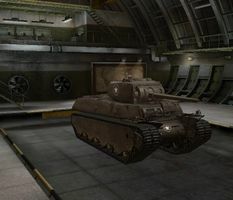 The design was somewhat similar in concept to multi-turreted breakthrough tanks developed in Europe in the 1920s and throughout the 1930s, such as the British Vickers A1E1 Independent or the Soviet T-35. Disadvantages of these "land dreadnoughts", namely their excessive size, difficulty in coordinating actions of the crew, and high production costs, led to abandonment of the concept in Europe. By October, the US developers reached the same conclusion as their European counterparts. The armament was changed to a single vertically-stabilized 3 inch (76.2 mm) gun and a coaxial 37 mm gun in a single three-man turret with both manual and electric traverse. The turret had a commander's cupola identical to that of the M3 Medium Tank. Additional armament consisted of two .50 caliber machine guns in a bow mount (operated by the assistant driver), two .30 caliber MGs in the front plate (fired electrically by the driver), one .30 caliber in the commander's cupola, and one .50 caliber in a rotor mount in the right rear of the turret roof (operated by the loader). The crew consisted of a commander (turret left), gunner (turret right), loader (turret), driver (hull left front), assistant driver (hull right front), and ammunition passer (hull). One of the main challenges was developing a powerpack for such a heavy vehicle. The Wright G-200 air-cooled radial gasoline engine was selected by a committee formed by the Society of Automotive Engineers, but no suitable transmission was available. The committee recommended developing a hydramatic transmission, while the possibility of using a torque converter or an electric transmission was also to be checked. In 1941-1942, three prototypes were built by the Baldwin Locomotive Works, one with an electric transmission and two with torque converter transmissions. Variants with hydramatic transmission were never completed. The prototypes also differed in hull assembly method; one had a welded hull and the other two cast hulls. On 26 May 1942, two variants with torque converter transmissions were standardized as the M6 and M6A1. Standardization of the electric transmission equipped T1E1 as M6A2 was never approved, but manufacturing of the vehicle was nevertheless recommended. It was proposed by the Ordnance Corps that 115 T1E1s would be built for the US Army and 115 M6s and M6A1s for US allies. The production started in December 1942. Some minor changes were introduced in the production vehicles: the cupola was replaced by a double-door hatch with a ring mount, and the machine gun in a rotor mount and the left front machine gun were also removed. However, by the time the M6 was ready for production, the Armored Corps had lost interest in the project. The advantages the M6 offered over medium tanks - it's much thicker armor and slightly more powerful gun, were offset partly by the shortcomings of the design; a very high silhouette, awkward internal layout, reliability problems, and partly by logistical concerns. By the end of 1942, the Armored Corps were sure that the new M4 Sherman gave adequate solutions for the present and near future, while being reliable, cheap, and much easier to transport. Work on M6 didn't stop at once. The T1E1 prototype was tested with a T7 90 mm gun and was found to be a satisfactory gun platform, although poor turret layout was again noted. 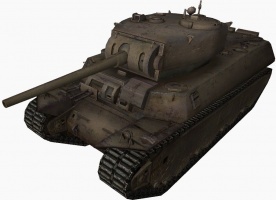 In August 1944, the Ordnance Corps recommended using the T1E1s produced to build 15 77-ton vehicles designated M6A2E1, with thicker (up to 7.5 inch vertical protection) glacis armor and a turret developed for the T29 Heavy Tank and armed with a T5E1 105 mm gun. The proposal was rejected by General Eisenhower. However, by late 1942, main development efforts shifted to other projects, one of which eventually resulted in the M26 Pershing. On 14 December 1944, the M6 was declared obsolete. Only forty units were produced and they never left US soil. Several toured the United States for propaganda purposes, where they gave performance displays (such as car crushing) at War Bond drives and the like. All were eventually scrapped, except for a single T1E1 on display at the United States Army Ordnance Museum, Aberdeen, Maryland. T1 - Cast hull, hydramatic transmission. Never built. T1E1 - Cast hull, electric transmission. Often unofficially referred to as M6A2. 20 units built. T1E2 / M6 - Cast hull, torque converter transmission. 8 units built. T1E3 / M6A1 - Welded hull, torque converter transmission. 12 units built. T1E4 - Welded hull, hydramatic transmission. Never built. M6A2E1 - Uparmored T1E1 with a new turret armed with a T5E1 105 mm gun. Never built. Front view of the T1E2 (M6A2), with several early M3 light tanks in the background. R.P. Hunnicutt - Firepower: A History of the American Heavy Tank, 1988 Presidio Press, ISBN 0-89141-304-9. This page was last modified on 8 August 2016, at 13:19. This page has been accessed 23,620 times.